It’s a great honor to present our first guest blogger. GOP Ian. Ian and I have two things in common, we work together and we love beer! But everything else we agree to disagree! Our personalities are like night and day. I’m a left winger and he’s a right-winger, I like Star Wars, he likes Star Trek! I’m Homer Simpson and he’s Ned Flanders…you get the point right? Our water cooler gang, anointed him GOP Ian because of his staunch advocacy for conservatism but we will change him eventually, he’ll be protesting in the mean streets of LA, grow his hair long and hug a tree in no time. And to be honest, he is a cool vato and we enjoy his banter and find his politics and views amusing – he brings a breath of fresh farts to our 9 to 5 daily grind. Without further a do, GOP Ian…..
GOP Ian here, giving my first review on Golden Foam Notes. I just want to say, this review is being composed just minutes after sampling the beer of the day, so please excuse any problems with my grammar or general intelligibility. 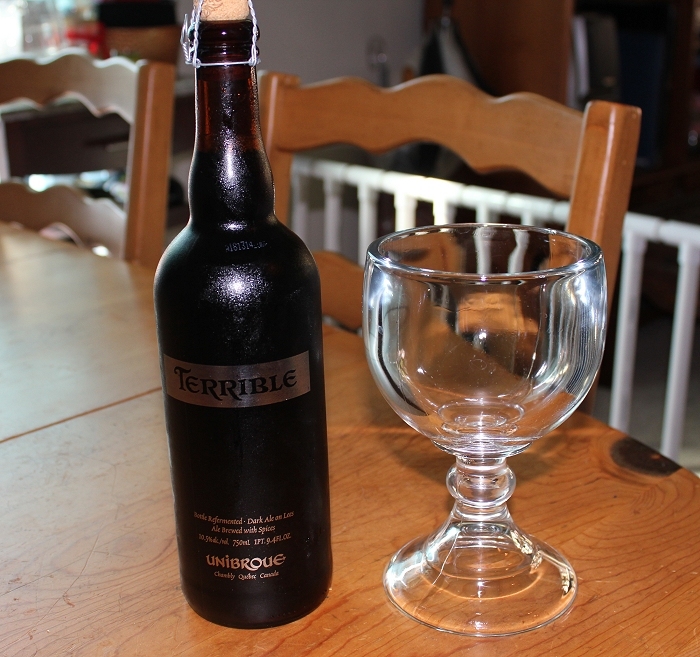 Today’s beer is “Terrible” by Unibroue, a Canadian company based in Quebec. My first and only exposure to this company was a Belgian style ale called “La Fin Du Monde” which translates in English to “The End of the World.” It’s a pretty good beer but this review is about “Terrible,” so moving on. I received this bottle from my next door neighbor who found it lying around (probably something his son bought and never drank) and thought to give to me, since he knows about my newfound appreciation for beer beyond Budweiser. By the way, just about e.v.e.r.y. beer is beyond Budweiser. So, after letting it hang around in my fridge, rent free for about 2 weeks, I decided it was time to review it, so here goes. This beer came in a 750ml brown, mysterious bottle, which is 1 pint, 9.4 ounces… that’s quite a bit of beer. The bottle is dark and says “Terrible” as if in warning to the wanna-be connoisseur, browsing the isles at the local Bevmo. The kicker though is the strength. It’s tipping the scales at 10.5% ABV (alcohol by volume)!!! That’s the strongest I have ever had in my rookie career. For comparison, Bud Light is 4.2% ABV, which means it’s comparable to drinking this stuff, not washing the glass, and then filling it with water… . thaaaat’s right. This stuff will kick you in the balls, and then your balls will kick your brain in the balls. Here I am, I survived the alcohol, and the rest of it… but that’s coming up. This Dark Ale which was brewed “On Lees” which from my drunken search on Wikipedia means it was brewed partially with dead yeast, potentially left over from wine, was a first time adventure for me. I started off by unwinding the metal wire from the cork, exposing the raw cork beneath. Then I twisted the cork, as I do for all corked beers, only this time it defied my thirsty might. I tried gripping it with my shirt between my hand and the cork, no good. I tried twisting the other direction, no good. I couldn’t believe it, this beer had already defeated me, not needing to tap into its 10.5% potency to do so. I would not be easily defeated however, not having touched a beer in over 4 days, so I changed my strategy and began using my thumbs to push at one side, then the other. I continued this all the way around until it seemed the seal had been broken. A final twist with my strong hand and the cork was loosed, as was the aroma of success. It was a malty scent, a sweet apple like aroma, reminding me of fruit that had been left in a basket and then forgotten. Not unpleasant at all, but definitely a surprise. The head (golden foam) was a little under an inch thick and quickly dissolved, leaving no lacing behind. I don’t know if the lacing is a big deal or not, but I thought I would mention it since all the “professional” reviewers do. The color was a n earthy brown. By the way, this beer seemed to get very good reviews so I was expecting a pretty darn good beer. Then came the first sip. It wasn’t mine.. I asked my wife to take the first sip since she was graceful enough to watch the children while her husband went into drunken fighter mode…ehh, writer mode. She made a face and said it tasted like all of my beers, like Vienna sausage, hahaha that’s no good, her rookie taste buds make me feel like a pro again. My first sip was like… a teaspoon of rubbing alcohol mixed with rotten fig. Never had either ? Good, you aren’t missing much. As you exhale your nose is stung by a potent alcohol type of burn that I should have expected from a 10.5% ale, but had forgotten about. Hot diggity damn that’s strong! I found that taking deeper swallows produced more of this unfriendly sensation so I sipped, letting the bubbles play on the tip of my tongue. The flavor is fruity, very fruity, making the earlier scentof fruits in a basket seem like a liar… there were really a lot more rotten fruits in that basket, and I think the basket had started to rot too ,ha! Very sweet, too sweet, the fig/apple flavors came though strong and sugary, leaving me with a mouth full of sugar and alcohol, but not in the same way as a margarita… this was just wrong. I guess I would best describe the flavor as “sickly sweet.” If you have experienced that smell at some point in your life then no explanation is necessary. If not, no explanation can help you. This is definitely not a refreshing beer, not even on a hot day, with its overpowering sweetness, rotten charm, and overly-powerful alcohol burn. It is a beer to have once you are already buzzing hard, and maybe not even then. It would have been nice to have a positive review for my first blog on Golden Foam Notes, but it is what it is, and better for you to get an honest review than a false pleasant one. This is not a beer I would buy, and probably not even accept for free again. I have a feeling this was a failed batch at Unibroue, and the master brewer thought that maybe by calling it was it is, the peasant folk would believe it was sarcasm and maybe even fool themselves into thinking they had just had an exotic bit of nectar which the rest of the world was missing out on. I can count myself amongst the suckers who sampled an entire bottle of this rotten concoction. On a scale of 1-10, I give this ale a 4. Why not lower? Because I can tell some effort with into this, with the spices and fruits. The result was catastrophic but I need to reward creativity and effort. Otherwise, we end up with Bud/Miller/Coors lights everywhere. A unique beer, but not anything I would recommend to someone I like. My next review will be of a beer I already know I like, but the bottle will have been aged a couple of months to extract the maximum flavor. Until then friends, until then. ~ by Golden Foam Notes on October 14, 2014. GOP Ian, great blog. Seems like you had a tough time unwrapping that bad boy! Interesting about the Lees…dead yeast hummm. Me personally, I yet to taste a beer that is pushing 10% + abv’s that I can truly like. Sometimes the alcohol levels pushing that high can be overbearing and ruin the beer tasting experience. 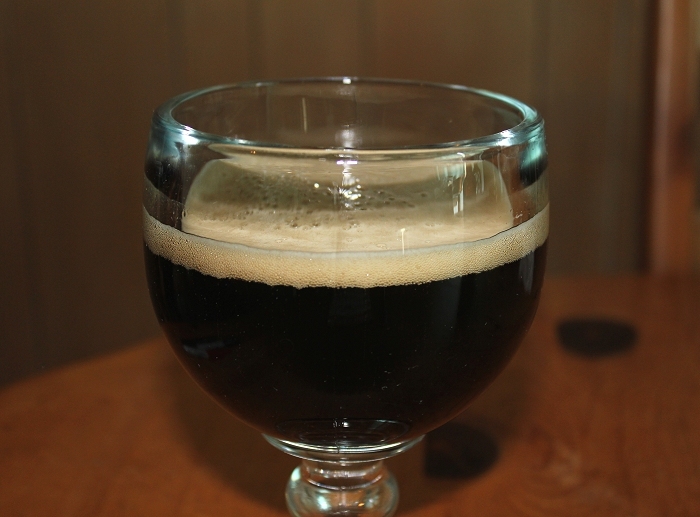 From what I get you have to sip this beer, not gulp, to get the full consumption experience. I appreciate the honest in your review and sure our readers appreciate it too. I look forward to your next review! I just want to thank all my fans, the people who supported me though this endeavor, my producer, and Golden Foam notes, for giving me a reason to drink. My next review will be of a better beer, and following that a beer I have never sampled. Set your phasers to stun my friends… until next time. Nice write up GOP!!! I’ll know to avoid this brew. But I got a bone to pick with you about your unfounded thrashing of the King of Beers.